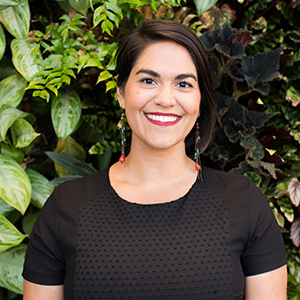 September 26, 2018 Maggie Awad is the Marketing Director at Arlington Transportation Partners. She says every commute to work is different with so many options in her neighborhood including bus, Metro and Capital Bikeshare. ATP Takeaway: When it's race day, you never know what obstacles might pop up. A deer? A slug to the wrong urban village? It's all here in the fourth annual Amazing Commute Race recap. 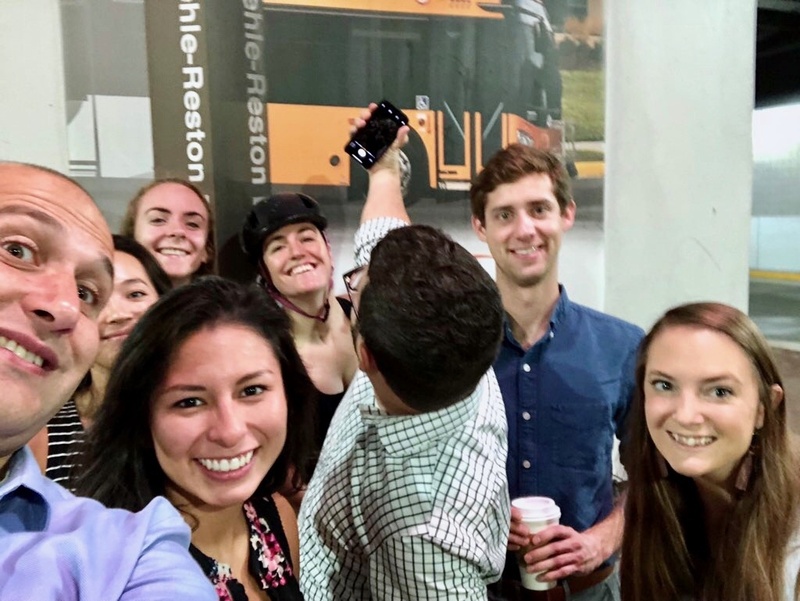 On a surprisingly gorgeous morning in Northern Virginia, Arlington Transportation Partners raced to our Rosslyn office for the fourth annual Amazing Commute Race. Like last year, we chose to start in Fairfax to replicate the most likely commute of our client base, this time starting in Reston to purposefully travel along I-66 with the new toll lanes. We'd like to note that our race started at 7 a.m., but perhaps a better and more realistic start time for many would be 7:30 a.m. We'll make that update in the fifth annual Amazing Commute Race in 2019! Maybe not so surprising, we had some major change up in our ranks but that's the beauty of the race. You never know what mode will come out on top. Find out who came in first, who thought they came in first, and who felt like they really won the race today. Race start time: 7:00 a.m.
Summary: While I may have technically lost the commute race, I believe I’m the one who really won in all of this. My bike commute from Wiehle-Reston was an amazing way to start the day. What a morning, surrounded by nature on the trail for almost the entirety of my commute and I got my workout in. It was great to see other people enjoying the beautiful morning on their bike commutes or morning runs and there were tons of adorable pups out. On top of it all, my commute was free. I did have to navigate some heavier trafficked roads to get to the trail, but once I was on it I didn’t have to worry about anything and just tuned into my body and the surroundings. Along the trail, there are points where you have to cross streets, but these have all been really well planned and cars seemed very familiar that people frequently cross and courteously stopped to let me through. As I got into Arlington, it got a bit hillier and my chain fell off, so I had to take some time to adjust that. If I had been familiar with the exact route and not had the chain mishap, I’m guessing this commute would take me an hour and a half from start to sitting at my desk (which includes a shower). For getting your workout, shower, and commute all in one, it seems like a great option. At 17.8 miles, this commute is a bit of a ride, but I have friends that do it every day and have said that it has helped them get in the best shape of their lives. Another great alternative for this commute could be using an electric-assist bike to help make the mileage a bit more manageable. All things considered, I will let you be the judge of who really won the commute race today. Summary: I’ll take a bus over other modes (except walking/running) any day, so I was excited to try out the Fairfax Connector Route 599 Pentagon-Crystal City Express. When the race started at 7:00 a.m., I headed over to the Reston North Park and Ride but my bus wasn’t leaving until 7:20 a.m. so I had a bit of down time. Once we left the parking lot, we flew by SOV traffic on Dulles Toll Road but then hit a bit of a stall along I-66. We still made it to the Crystal City Metro by 8:10 a.m. as scheduled and I transferred to the ART 43 for a direct route to Rosslyn. If I lived near Reston and worked in the Crystal City/Pentagon City area, I would definitely use this bus daily. It’s also a great option to be aware of on days there are delays on the Metro or highways. Summary: I enjoyed a relaxing commute despite the slight delay on Metro (a deer was struck near Addison Road). I missed the initial train by a second, which added an eight-minute wait to my trip. Not too bad though, as I enjoyed exploring the station since I rarely take the Silver Line going West. Once I got on the train, it was smooth sailing all the way to Rosslyn. I listened to my favorite podcast at the moment, I got some shut-eye between East Falls Church and Ballston, and I even got a mini workout when I raced up the escalator and sprinted up the hill to hopefully reach the office first. Next time I’ll check the Twitter feed. Keara was the passenger updating the team, so Erica (the SOV driver) could safely use the roads. Summary: This was my second year as the group’s SOV driver and I would say the drive was easier than last year’s from Springfield. We took Dulles Toll Road to Chain Bridge Road to the GW Parkway. Traffic was steady, but if we left later in the morning, we would have had to deal with considerably more. Summary: While waiting at the slug line in the Herndon-Monroe Park-n-Ride parking garage, I talked to the dedicated slugs to get their insights. Unlike last year’s slug starting point, at this one, you negotiate with the driver as to where you want to go and where they are going. I made the strategic error of hearing the driver say Crystal City and thinking that was where I needed to be. In my defense, the other slugs were going to DC and I wanted to make sure I was at least getting to Arlington. Honestly, I just wasn’t awake and thinking. It was a super-fast and smooth ride past Rosslyn around 7:30 a.m., and when I was dropped off at the Crystal City Metro Station, I opted to jump on the ART 43 express bus to get back to Rosslyn. I was in the office at 7:47 a.m. Again, I have to say, slugging is pretty flawless! Summary: I started my telework day by waking up at 5:40 a.m., feeding the dog and making a pot of coffee. While my coffee brewed, I leashed up the pooch and took her for a walk. Some exercise right away in the morning is good for us both and it’s also important for the dog to work out her energy so she isn’t bugging me all day while I’m trying to work. After the walk it’s time to get camera ready. I usually have a few Skype meetings scheduled daily and it’s nice to feel put together. Living in central time and working in eastern time means sitting down to work earlier but I make sure I log off after a full work day as well. In my book, telework wins every day. We have our second #AmazingCommuteRace winner—#TeamTelework! 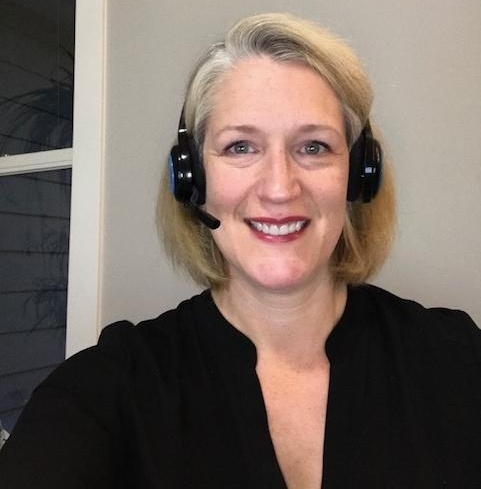 🎉 Since we have flexible scheduling options at work, @TDMWendy can jump online quick to make sure her early-in-the-office employees don’t need anything right away. Summary: We enjoyed an easy commute into Rosslyn this morning from Wiehle-Reston East. We took the Dulles Toll Road and used the HOV-lane to stay out of the main traffic. We then merged onto I-66 and avoided the $11.25*** toll by traveling with an E-ZPass Flex in HOV-mode. You can travel on I-66 without paying a toll by traveling with at least one other person in your car (HOV2+). With light traffic on the highways, and Claudia’s amazing Canadian-themed playlist, we made it to the office in a flash and in style. We would have been even faster had we not overshot our exit getting into Rosslyn, whoops! Carpooling or vanpooling is the way to go from Reston. **The price for monthly parking in Rosslyn runs about $160 per month. Even if you purchase the monthly parking, you still are paying about $8 for the day. ***$11.25 is not the set price for traveling on I-66, the tolls fluctuate based on demand. You can read more about the tolls by visiting our Commute66 website. 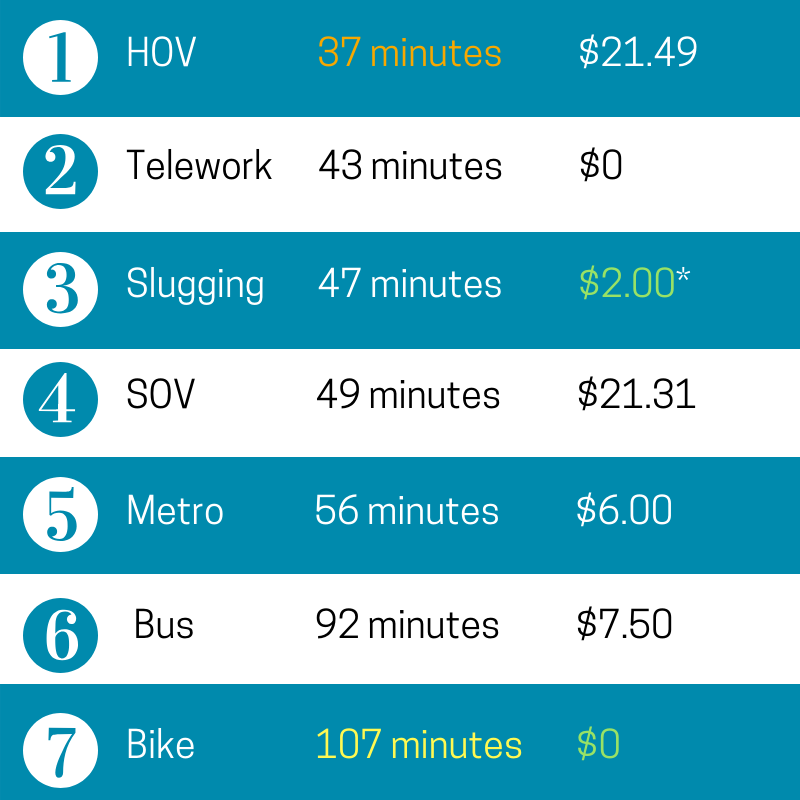 This year was certainly interesting when you take a look at the cost and time it took to commute from Wiehle-Reston. SOV came in slightly cheaper than HOV due to a minor mileage difference and both paying to use the Dulles Toll Road, and slugging had an accidental cost of $2.00* due to a mistaken destination correction. We think it's worth mentioning again that had we left 30 minutes later, the SOV time would have likely been drastically different. The Fairfax Connector bus also left nearly 20 minutes after other modes due to scheduling and slugging would have been quicker if taken directly to Rosslyn. Given this is the first time we've tried these routes, there was a small learning-curve for our team, but that's just part of the fun. At the end of the day, this race is a good way to connect with how our clients commute and to try new or different modes ourselves. Sheila (on the bike) is certainly pleased with herself for her morning ride and we're all admittedly impressed. If you're interested in trying a new or different commute, connect with us. We'll even help you route a bike option if you want to follow Sheila's lead or introduce you to slugging.